Masip-Alvarez, A.; Hervada-Sala, C.; Pàmies, T.; Arias, A.; Jaen, C.; Rodriguez, M.; Romero, D.; Nejjari, F.; M.D. Alvarez; Roca, M.; Hernández, J.; Montferrer, R.
This document presents the use of a self-video-recording service for the integration and assessment of certain generic competences (oral and written communication, teamwork and third (English) language) in all degree programs related to the Industrial area at the Terrassa School of Engineering (EET). The resulting service allows to carry out the assessment through active and collaborative learning methodologies using ICT as a support, becoming an educational resource where students are encouraged to evaluate their own activity, individually and in groups (co-evaluation), and with which the faculty can enhance certain sections of the syllabus while also evaluating generic competences. This paper outlines the rationale and design of the system based on self-recording-video that assists work on some generic competences. A preliminary experience has taken place and it has been carried out by volunteer students and some professors from the promoting team. It consisted of following all steps to obtain the video-recording as a result and fulfil the further assessment. Preparing the defence of the final project career, explaining the way a problem is faced are examples of use of the service endowed to assist the assessment of some generic competences. A good number of students and professors have participated in this preliminary experiment carried out on some subjects and in which oral effective communication will be assessed. A specific rubric for the assessment of generic competences has been used both for students and faculty. There is a summary of qualitative feedback from both students and instructors, and where several issues related to improving the self-assessment and self-video-recording system, are discussed. Finally, a survey is proposed, whose results will be helpful for its improvement. 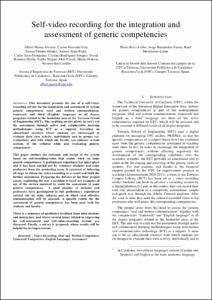 This document presents the use of a self-video-recording service for the integration and assessment of certain generic competences (oral and written communication, teamwork and third (English) language) in all degree programs related to the Industrial area at the Terrassa School of Engineering (EET). The resulting service allows to carry out the assessment through active and collaborative learning methodologies using ICT as a support, becoming an educational resource where students are encouraged to evaluate their own activity, individually and in groups (co-evaluation), and with which the faculty can enhance certain sections of the syllabus while also evaluating generic competences. This paper outlines the rationale and design of the system based on self-recording-video that assists work on some generic competences. A preliminary experience has taken place and it has been carried out by volunteer students and some professors from the promoting team. It consisted of following all steps to obtain the video-recording as a result and fulfil the further assessment. Preparing the defence of the final project career, explaining the way a problem is faced are examples of use of the service endowed to assist the assessment of some generic competences. A good number of students and professors have participated in this preliminary experiment carried out on some subjects and in which oral effective communication will be assessed. A specific rubric for the assessment of generic competences has been used both for students and faculty. There is a summary of qualitative feedback from both students and instructors, and where several issues related to improving the self-assessment and self-video-recording system, are discussed. Finally, a survey is proposed, whose results will be helpful for its improvement. Masip, A. [et al.]. Self-video recording for the integration and assessment of generic competencies. A: IEEE Global Engineering Education Conference. "2013 IEEE Global Engineering Education Conference (EDUCON)". Berlin: 2013.